Canada joined the U.S. states of California, Massachusetts, Maine, Alaska, Colorado, Washington and Oregon as the first G-7 country to OK adult use of pot Wednesday. Medical marijuana company Tilray, whose stock has posted a meteoric rise on the Nasdaq since its U.S. IPO, shed more than 6 percent Wednesday. Tilray, Canopy Growth and Aurora Cannabis are currently the most popular post stocks among traders on Wall Street. Aurora got approval to list on the NYSE on Wednesday. Popular marijuana stocks fell across the board Wednesday, paring extreme gains so far this year, as investors cashed in a bit of their bet as Canada became the largest country to legalize the recreational use of cannabis. After months of political haggling and legal debate, Canada joined the U.S. states of California, Massachusetts, Maine, Alaska, Colorado, Washington, Nevada, Vermont and Oregon as the first Group of Seven country to OK adult use of pot. The major cannabis stocks ran up in anticipation of this day and offered investors on Wednesday a reminder of just how volatile some of the young pot companies have become amid a flurry of news and speculation. Medical marijuana company Tilray, whose stock has posted a meteoric rise on the Nasdaq since its initial U.S. offering in July, shed more than 6 percent Wednesday. Canopy Growth, another favorite in the space, lost 3.5 percent on the New York Stock Exchange. Tilray is up 750 percent from its IPO price of $17 while Canopy is up about 100 percent since mid-July. Some members of Wall Street's cannabis community cautioned that the rapid rise in pot stock prices could be followed by modest sales in the early innings of legalization, including the top analyst in the space. "While the opportunity is large, the market is going to develop in phases both in terms of product availability as well as retail access points," Cowen analyst Vivien Azer told CNBC in an interview Tuesday. "For product availability on day one it's going to be pretty limited: no traditional vapor products, beverages or edibles. That could take as much as a year." Aurora Cannabis dropped 1.5 percent in Canadian trading, while Cronos Group lost 5 percent in Toronto. The ETFMG Alternative Harvest exchange-traded fund — one of Wall Street's favorite marijuana ETFs — fell 3 percent in the session. 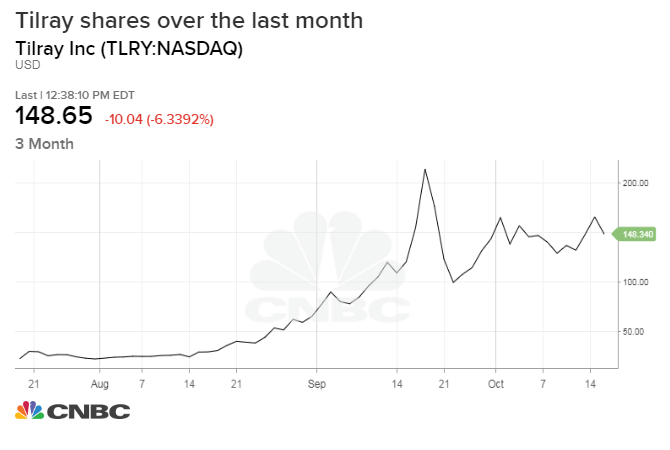 Encapsulating the ballooning interesting in cannabis, medical marijuana company Tilray has drawn scores of headlines in recent months both for developments in the pharmaceutical space and its rapid swell in market cap. The Canadian company, which posted just $20 million in revenue last year, has seen its market cap buoy to more than $13 billion in recent months. Tilray posted one of its best days on Wall Street September after announcing approval from the Drug Enforcement Administration to import pot to the United States for medical research. The Vancouver Island, Canada-based company plans to work with the University of California San Diego Center for Medicinal Cannabis Research to study the safety, tolerability and efficacy of marijuana for a neurological disorder. "The pace and change is accelerating rapidly and we're seeing well-funded, professional brands emerging," CEO Brendan Kennedy told CNBC an interview Wednesday. "It's a global opportunity and we think we have a first-mover advantage." Founded in 2013, Tilray was incorporated under Kennedy's cannabis-focused private equity venture Privateer Holdings. Privateer, which still owns about 80 percent of the company, announced earlier this year that it has raised $200 million to invest in cannabis brands. Billionaire investor Peter Thiel's Founders Fund became the first institutional investor in the cannabis industry through Privateer's $75 million Series B financing round in December 2014, according to the company's website. Price move since July 19: approx. 760 percent. Canopy Growth, based in Smiths Falls, Canada, is another emerging leader in the cannabis space. Headquartered about an hour's drive southwest of Ottawa, the company's stock rallied earlier this week after it announced plans to acquire a U.S.-based hemp research company. Canopy Growth said its purchase of Evergreen, Colorado-based ebbu will "complement and accelerate" its ambitions to expand into new types of consumer products, including more productive plants and the technology needed to incorporate cannabidiol into consumer goods. Canopy was the first publicly traded cannabis company in North America in 2014 under the leadership of co-CEO Bruce Linton. The company markets medical marijuana products — including flowers and oils — in Canada, Germany and the Czech Republic and recently tightened its relationship with Corona brewer Constellation Brands. The beer brewer is investing about $4 billion into the Canadian marijuana grower in its efforts to broaden its strategic portfolio as beer consumption in the United States declines. "'Better' will be a big argument," Linton told CNBC's Deirdre Bosa from a Canopy store in Newfoundland on Wednesday. "People are going to start realizing that the product that they get from the illegal dealer comes from officially, nowhere." Price move since July 19: approx. 100 percent. Aurora, another Vancouver-based grower, has made headlines in recent weeks amid reports that it is in talks with Coca-Cola to develop weed-infused beverages. Some analysts have hypothesized that such a partnership would likely focus on developing health-focused beverages aimed at easing inflammation, pain and cramping, a product that could appeal to athletes. The company said later in September that it does not have any formal agreement to partner with a beverage company. The New York Stock Exchange certified its approval for listing and registration of Aurora shares Wednesday, according to a Securities and Exchange Commission filing. Shares of Aurora are up 390 percent over the last 12 months in Toronto. Price move since July 19: approx. 71 percent. — CNBC's Berkeley Lovelace, Jr. contributed reporting.